After a growth rate of 2.3% in 2016, house prices have grown by 3.5% in 2017. This growth has been supported by interest rates that remain very low, supply shortages in some countries and an increase in disposable income and hence demand. In 2018, we expect house prices to grow by 3.3% which is slightly higher than our previous forecast. With consumer confidence at its highest level since 2001 and still very generous financing conditions, the recovery should continue, which in turn is positive for activity levels and employment growth. Business confidence in the construction sector reached levels in 2017 not seen in the last ten years and hiring intentions followed. 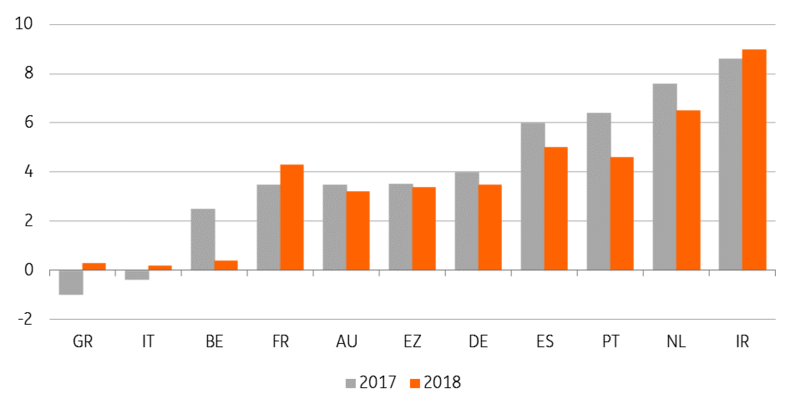 This is likely to decrease supply shortages where they still exist, limiting house price growth somewhat in the whole Eurozone in 2018. In 2018, we expect house prices to grow by 3.3% which is slightly higher than our previous forecast (3%), due to the upward revision of forecasts in some countries. While still being a high figure, it implies a slight slowdown compared to 2017, which is logical as long-term interest rates should start to make mortgages slightly more expensive this year. This should continue in 2019 where we expect a 2.8% price growth. Having said that, house price growth should remain firmly above inflation. As a final note, keep in mind that the 3.3% expected growth figure is a weighted average of all the constituent countries of the Eurozone that can have very different individual situations. In Italy, the ongoing recovery of the economy remains positive for the housing market. For the time being this has been reflected in higher house transactions, but at a declining pace. In 3Q17 the number of house transactions was up by 1.5% YoY (3.8% YoY in 2Q17), down from two-digit growth clips recorded in 2016. Improved affordability is making the purchase more attractive. The recovery in loans for house purchases continues at a stabilised 2.1% yearly rate. The December 2017 Bank of Italy-Tecnoborsa survey showed that the loan to value ratio, at 74.4% is now higher than before the outbreak of the great financial crisis and is stabilizing, as is the ratio of house purchases financed via mortgages, now at 78.8%. The same survey showed that the average discount from the original offer price resumed declining and reached 10.2% (from 12.5% in 3Q). Latest Istat house price data shows a divergence between existing homes (still declining) and new homes (picking up). We expect the ongoing moderate recovery of disposable income, in conjunction with still cheap mortgages, to support further house purchases. However, the ample slack in the market should prevent a big short-run showing on prices. We expect house prices to be marginally negative in 2017, and to edge up only slightly in 2018. In Spain, due to growing disposable incomes and lower unemployment, the house price recovery is still accelerating, reaching 6% in 2017 after 4.7% in 2016. As house prices remain 25% below their pre-crisis levels, there is still room for recovery. We expect house prices to grow by more than 5% a year in 2018 and 2019. In Greece, signs of an economic turnaround are getting more consistent, but the recovery in disposable income is still at an early stage. Notwithstanding the ongoing decline in the unemployment rate, slack in the labour market remains ample, and the delicate position of Greek banks and their Non Performing Loans is still weighing on house-purchase related mortgage lending. In November, lending for house purchases was still contracting at a 9.3% YoY clip. 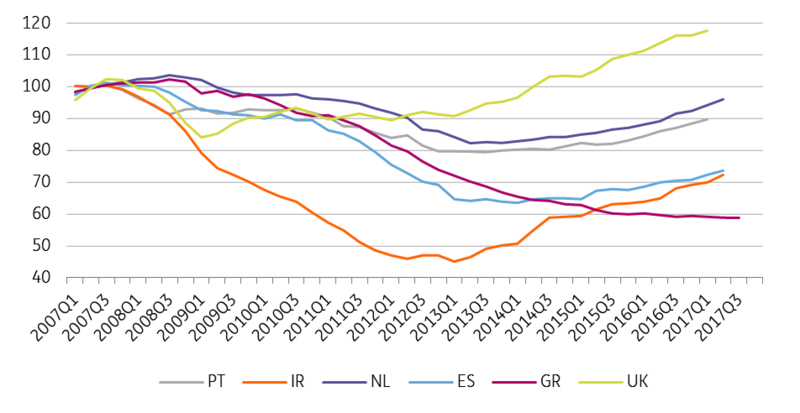 Furthermore, very high property taxes in Greece continue to discourage demand in our view. Still, in 3Q17 the contraction of house prices slowed down to -0.6% YoY (-1.2% in 2Q17), signalling that stabilisation is possibly in sight. We see the YoY price contraction to end in 1H2018 and to turn very marginally positive thereafter. This will very much depend on how Greece will be able to exit the third programme. In Portugal, the domestic-demand based recovery of the economy continued over 2H17. While credit conditions remain very favourable for borrowers, lending activity has been hampered by the ongoing private sector deleveraging. In the short run, the real estate market seems strongly supported by the recovery in disposable income and, price-wise, by an insufficient construction rate. International investors are often reported as a key player, particularly in metropolitan areas. As employment growth is proving stronger than originally anticipated, we believe Portuguese house price developments to remain upbeat for most of 2018, and to decelerate after that as the very high elasticity of employment to GDP growth will start proving unsustainable. Low German interest rates, a strong labour market and excess demand for housing in urban areas should add upward pressure on housing prices. In France, lower interest rates since mid-2015 revived mortgage credit growth which came up from 2.3% per year at the beginning of 2015 to more than 6% YoY at the end of 2017. This is supporting a stronger than expected recovery in house prices, which should accelerate from 5.1% to 7.6% and 6.5% YoY respectively in 2017 and 2018. Lower residents' taxes in 2018 could also help to give the market a boost. We expect higher interest rates to slow down the current trend only slowly in 2019 and 2020. In the Netherlands, demand for housing remains vigorous thanks to the strong growth momentum, the record high confidence and a fiscal boost to disposable income. Supply, on the other hand, is decreasing rapidly, especially in the largest cities and that's where we're seeing further steep price increases; we still expect house prices to grow by 6.5% in 2018 after 7.6% in 2017. In Belgium, house price growth should have rebounded slightly in 2017, at least by 2.5% after 0.8% in 2016. The fact that market prices continued to increase when the market was turning elsewhere in Europe and that low-interest rates have given it a further boost, makes the market vulnerable to higher interest rates. This is why we expect a small price correction to materialise in 2019-2020. In Austria, housing demand remains higher than supply on the back of ongoing favourable credit conditions and population growth, keeping house prices at elevated levels.